The Apple iPhone dominates the world of consumer smart phones, but is a bit of a laggard in the business market, right? Wrong! It turns out that the opposite is true. Apple is in fact a relatively minor player in the global consumer smart phone market, but by far the dominant player in business. According to Gartner, Android has 52.5% global smart phone market share, Symbian 16.9%, iOS 15%, BlackBerry 11%, Bada 2.2% and Microsoft 1.5%. In business, however, the iPhone has recently emerged as the top market-share leader with 45%. To achieve this dominance, Apple recently edged out BlackBerry, which has now fallen to 32% of the market. Android gets 21%, recently surpassing Nokia. To be accurate, these numbers are apples and oranges, so to speak. The Gartner numbers are for both consumer and business and worldwide, and the iPhone numbers are businesses worldwide. Android’s big global consumer numbers and iPhone’s big business numbers say more about whose got money and who hasn’t than what people’s preferences would be if all phones were priced the same. The fact that very cheap Android phones exist in the world, but very cheap iPhones do not exist, explains much. Still, it’s a shocking result that’s counter to the conventional wisdom. Perhaps even more shocking is BlackBerry’s recent second-place status in businesses and enterprises to the iPhone. Business is all BlackBerry’s got. Yet iPhone clobbers RIM in this space now. More to the point, how can a phone that supposedly ignores business concerns surpass a phone that’s totally designed for business in the business marketplace? Here’s why iPhone beats BlackBerry in business. It’s hard even for me to believe now, but when the iPhone first came out in 2007, I was too enamored of my BlackBerry Pearl 8100 to get one. I loved that phone. It was small, and… and… it was… It was really small. Unfortunately the screen was tiny, and the user interface was like something from the Spanish Inquisition. As a BlackBerry fan who switched to Apple, I was a fruit-swopping trend-setter, though ahead of my time. Gadgets-for-cash startup Gazelle described recently a trend among Blackberry users trading in their devices. The company says the main reason is the iPhone 4S. And while Gazelle data may indicate that Apple is the culprit for killing BlackBerry, in fact Google has a hand in the demise as well. Not only has Google successfully developed a thriving app ecosystem like Apple has, and provides a compelling alternative, the company has also recently done something somewhat devastating to the BlackBerry’s reputation — they pulled the BlackBerry Gmail app. Of course, this isn’t the end of the world — or even the end of Gmail on BlackBerry. The mobile browser version is still there. But it highlights RIM’s continued loss of momentum. OK, but why iPhone over BlackBerry? One explanation for the rise in iPhones and fall of BlackBerrys is that companies are increasingly allowing employees to choose and buy their own phones, rather than buying company phones and issuing them to employees. Related to that trend is a general move away from in-house, custom applications toward browser-based access and cloud computing. When data access is standardized, you don’t need a special application running on the client device and therefore there’s less incentive to force everyone to use the same phone. And here’s another trend I haven’t seen anyone else suggest, but it’s one I’ve detected by talking to IT professionals — they love iPhones, too. People who run IT departments at medium-sized companies tend to personally evaluate major handsets when they come out. They have budgets for buying boatloads of handsets to make sure everything works for mobile workers. A huge number of these professionals try iPhones, a large number of Android phones, BlackBerries and other major handsets. And after doing these evaluations, they tend to prefer iPhones for their personal handsets. These people are also major influencers within their companies, and they’re telling co-workers to buy iPhones because they believe it will reduce their own tech support burden. I have no solid data to support this. But it appears to be a trend among the IT managers and CIOs I’ve talked to. Another big problem with BlackBerry from a competitive standpoint is that its original claim to fame is no longer valid. Years ago, BlackBerry was the best phone for typing messages. People texted and emailed like crazy from their BlackBerries. And people loved the wide handset with spacious physical keys. 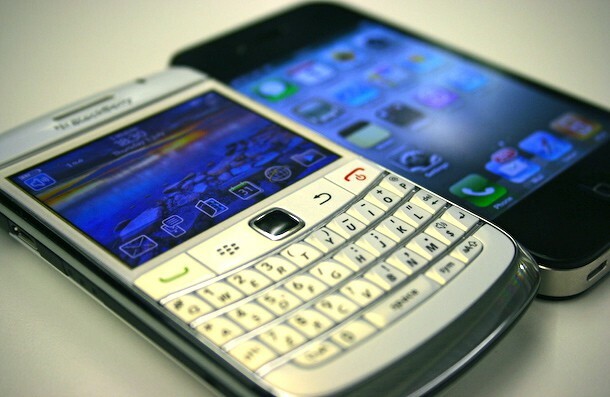 Everybody caught up with BlackBerry on messaging services. Recently iMessage provided a superior alternative and Siri pounded the final nail in that coffin. And physical keyboards have generally fallen out of favor to make room for bigger and better screens. It doesn’t help that RIM uses a proprietary network that goes down and causes regional blackouts from time to time. For many users, the question isn’t why does iPhone beat BlackBerry, but why in the hell would anyone choose a BlackBerry at all? Ultimately, it’s not all that complicated. The iPhone beats BlackBerry in business because business people are people, and people prefer iPhone. What’s really changed is that the barriers to people choosing their own phones have gradually fallen away. And once given the chance, people are choosing iPhones.